The following is some clippings from Isabell’s writings. 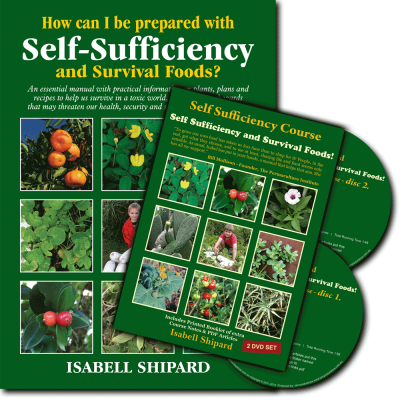 “Make your garden a wonderful place of peace where plants flourish, and food plants can be picked absolutely fresh, at their optimum nutrition. The body is self-healing. Herbs support the innate healing process. 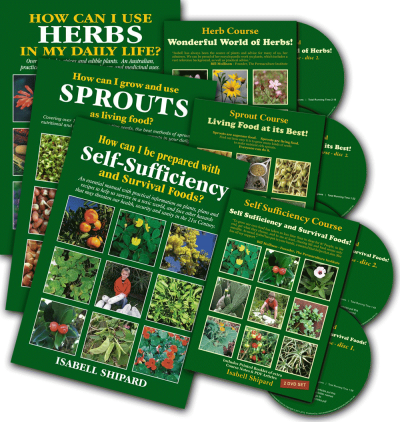 Herbs are very complex with many constituents and various actions, e.g. licorice has been found to contain over 600 constituents, which indicates it also has many actions. All herb properties can be placed in one or more of three general classifications, according to the primary actions they may produce in the body. 1. The first classification is detoxification. 2. The second classification is symptom relief, to counteract or relieve specific symptoms. 3. The third classification is of building and toning, as they strengthen the body, improving the functions of the internal organs and strengthening the body’s resistance to disease. 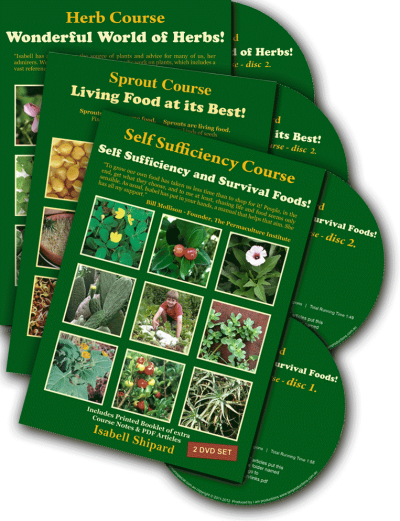 Harness the healing power of natural herbs to treat common health disorders and to live a healthier life. Herbal remedies help to accentuate the natural healing abilities of the body. The power of healing herbs are very real. For this reason learning about herbs is so worthwhile. 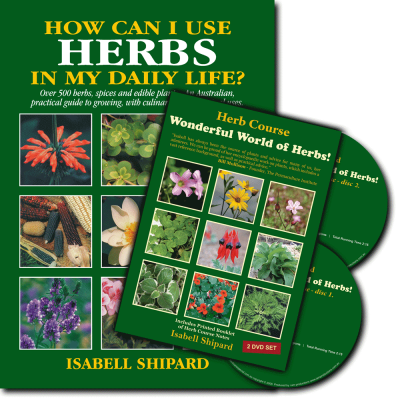 By increasing our knowledge of herbs, and then using the herbs, we can truly get the benefits in our daily lives. Today I have been propagating some Rau om (Limnophila aromatica) a delightful task, as I just love the rich, intense fragrance when leaves are crushed and the aroma inhaled… just so wonderfully refreshing, energy boosting and tantalising. 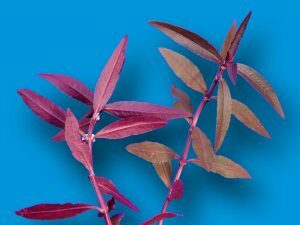 Leaves add a great flavour to salads, also meat, fish and savoury dishes, soups, vegetables, rice and sweet and sour dishes, dips and appetisers. Rau om is one of my favourite herbs, for its fabulously refreshing aroma and appealing flavour. Crush leaves for the refreshing aroma, a great aid to relax the body when feeling stressed, exhausted, and needing a pick-me-up. Aromatic herbs have many facets to help the body heal. Some aromatic herbs have medical properties that are antiseptic, anti-inflammatory, sedating, or enable the body to release mucus, or provide a stimulating action to the blood and circulatory system. Aromas work on the body’s neuro-transmitters, which then act to clear toxins, relieve tension, or strengthen different parts of the body, and give an energy boost. (Oxalis tuberosa) also known as New Zealand Yams; actually native to South America, where it is a staple food for a large population as it can yield twice that of a potato. The stems of the plant and the tubers are red. (Alternanthera versicolor) a ground cover, the small red/purple coloured leaves can be used in salads, as a garnish, etc. 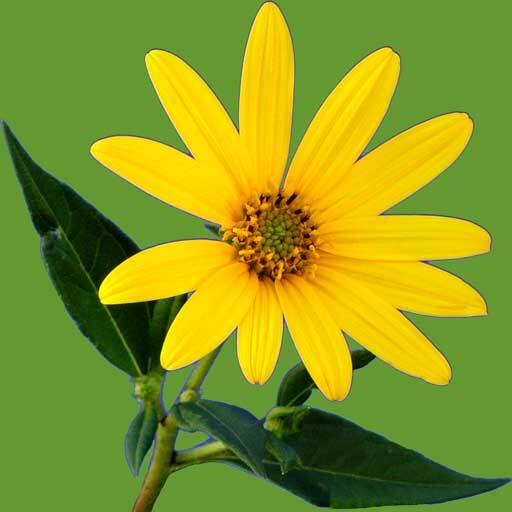 The plant is valued in South East Asia for strengthening the eyes and nervous system. (Hibiscus acetosella) Hardy perennial bush 1-3 meters with stunning dark red foliage, of tri-lobed leaves. Pruning the bush regularly (eating the leaves in salads or cooked dishes) will keep the bush of compact growth. 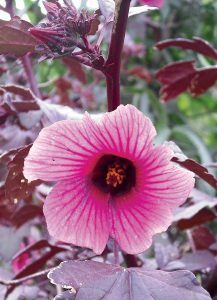 The petite watermelon-pink hibiscus flowers make an eye-catching display. Leaves eaten fresh have a lemony, mildly-sour flavour. Flowers are eaten also. Sour foods help to strengthen the immune system. An infusion of the leaves in water made as a tea is used for fevers, anaemia and as a tonic. 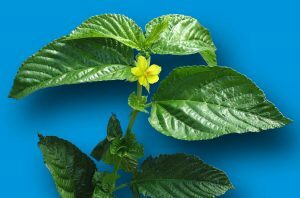 The mucilage content of the leaves is known for the soothing effect on inflammation and irritation to the alimentary canal, respiratory and urinary system. Researchers say, anthocyanins are powerful antioxidant flavonoids, that can inhibit DNA damage and act as an anti-carcinogenic force; and may assist the peripheral nervous system, the skin and collagen, cognitive and motion function, and have a role to play in vision strengthening, besides enhancing memory and heart health. Flavonoids are compounds that protect cells against free radical damage, which at cellular level has been linked to cancer, aging, atherosclerosis, transient ischemic attack (TIA’s), inflammation and neuro-degenerative diseases of Parkinson’s and Alzheimer’s. The experimental evidence has demonstrated anthocyanin benefits for diabetes and pancreatic disorders in recent years, and the efficacy is attributed to the multiple, simultaneous biological effects these colour pigments may have in the body, including prevention of the generation of free radicals, reduced pancreatic swelling, and decreased blood sugar concentrations in urine and blood serum. 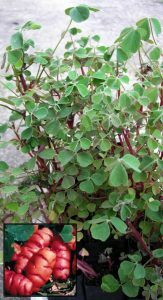 The anthocyanis have aroused considerable interest recently because of their potential beneficial effects on human health: they have been reported to have anti-viral, anti-allergic, anti-platelet, anti-inflammatory, anti-tumor and anti-oxidant activities. A recent report from NaturalNews stated that diabetes continues to grow at a staggering rate with 1.6 million new cases being diagnosed each year in the US (no doubt Australian figures are similar). Emerging evidence, now clearly demonstrates, that this insidious disease can be prevented and controlled with a diet naturally high in green leafy vegetables. The results of a study published in the BMJ (British Medical Journal) reviewed six studies covering more than 220,000 people, concluding that one and one half servings of green leafy vegetables per day lowered the risk of Type II diabetes by 14%. We all need to be mindful of the benefits of greens in our daily diet. Let’s all add more salad greens to our plates this summer…. 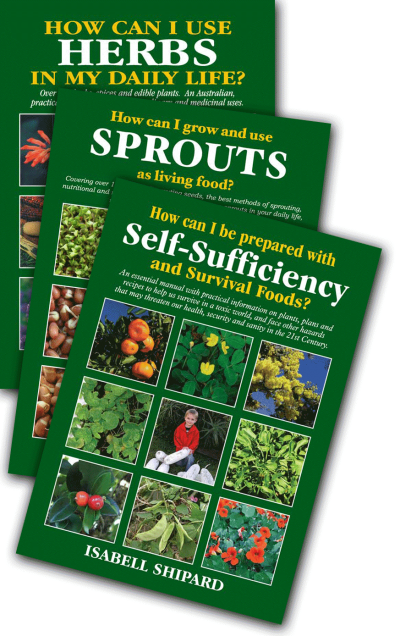 Great ones to grow and use are watercress, salad mallow, sheep sorrel, lebanese cress, rocket… to name a few. 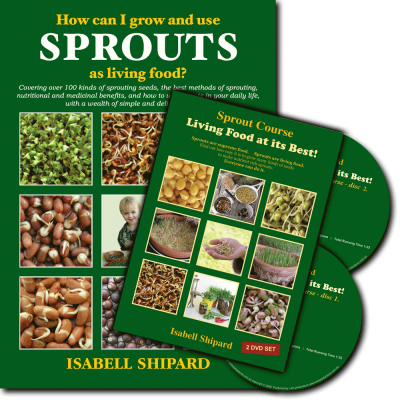 If you are interested in knowing more about these plants and how they can support and strengthen the body then check out Isabells books and DVDs. 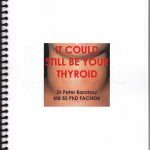 The author Dr Peter Baratosy, makes us aware, that thyroid disease is a very common problem, and becoming more common, largely due to conditions in our modern way of life, in a toxic world. It is not just the function of the thyroid gland itself, but whether the body can use the thyroid hormone. There are many blocks to the proper use of the thyroid hormone. The gland may be making the hormone, therefore the blood tests may show adequate hormone levels, but the body acts as if there is no hormone. Often, a normal blood test, does not necessarily rule out a thyroid problem. Essential to thyroid well-being is a good digestive system, together with sufficient stomach acid and enzymes, plus adequate protein, and the balance of the necessary vitamins and minerals the thyroid gland requires for the intricate bio-chemical reactions to occur to make T3, the active hormone. The book gives the symptoms of hyperthyroidism (over-active thyroid) and also hypothyroidism (under-active thyroid), and covers methods of treating thyroid imbalance, including using herbs. 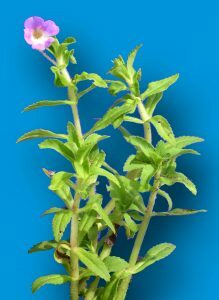 The herbs Brahmi (Bacopa monnieri) and Indian Ginseng (Withania somnifera) have a thyroid modulating action and are often used in hypothyroidism. Indian Ginseng (also known as Ashwaganda) has been used in India for thousands of years as a daily rejuvenating herb and health tonic. Essential Fatty Acids are essential to the cell membranes, to allow the thyroid hormone access to the cells. Herbs for treating hyperthyroidism include Lemon Balm (Melissa officinalis), Gypsywort (Lycopus europaeus), Motherwort (Leonorus cardica, and Scullcap (Scutellaria lateriflora). The book explores many of the issues of thyroid problems that orthodox medicine may not consider.